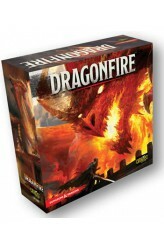 Dragonfire is a cooperative deck-building game set within the world of Dungeons & Dragons. 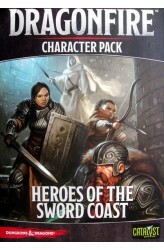 Players choose from a number of races — from dwarf to elf, half-orc to human — while assuming the quintessential roles of cleric, rogue, fighter, and wizard. 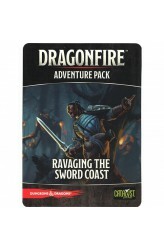 Equipped with weapons, spells, and magic items, players begin their adventure along the famed Sword Coast, then expand to other locales across the Forgotten Realms, such as Baldur's Gate, Neverwinter, and Waterdeep in future expansions. Along the way, players level up their characters, opening access to additional equipment, feats, and more. Join the quest, and build your own legend! https://www.youtube.com/watch?v=dTRwMg7BGNI .. 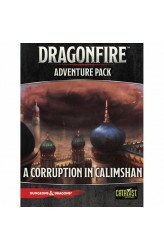 The exotic cities and arid deserts of Calimshan hide wonders untold...and terrors unknown! Conquer new encounters, including the all-new Desert environment. In the shifting sands, claim new Magic Items and Market cards, along with Crafting Poisons, in the next chapter of Dragonfire Adventures! 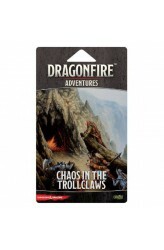 ..
Monstrous hunger shall not be denied in this second installment of the Dragonfire Adventures. New encounters await, guarding precious treasures for the stalwart adventurer. https://youtu.be/gSkW0W-mtHA .. Your relentless enemy, the hobgolin warlord Torog-Kaitan, has increased in power, and his new army is wreaking havoc up and down the Sword Coast! Challenge two new Encounter Decks, earn new Magic Items, and gain powerful new Market cards in the next chapter of Dragonfire Adventures! .. Dangers lurk along the coast and in the depths of the Sea of Swords. Challenge two new Encounter Decks introducing an all-new environment: Coastal! 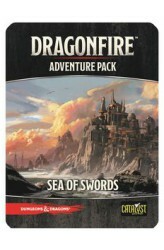 Discover new Magic Items and Market cards in the third chapter of Dragonfire Adventures! Contents: 30 encounter cards 12 market cards 9 magic item cards 2 character screens 18 stickers 1 adventure 1 adventure ship 1 rules sheet .. Evil awaits in the catacombs surrounding Dragonspear Castle. Challenge new encounters with all-new magic items and market cards! 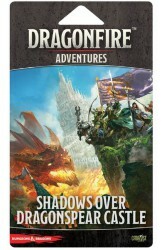 The first chapter of the Dragonfire Adventures. .. The Moonshae Storms campaign builds off of An Ancient Evil Arises from the base game, as your continuing quest takes you to new lands. A brewing conflict threatens to drown the Moonshae Isles, as lycanthropes and their fomorians allies seek to change the balance of power. Will you tip the tide? 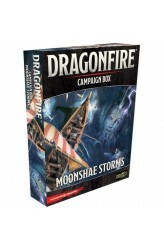 Moonshae Storms is the first Dragonfire Campaign Box. Face encounters from the all-new Mountain environment, and get fully equipped with new Market cards and Magic Items! Also included are eight new Character screens, introducing the Barbarian Character Class, as well as alternative human races: the Folk and Northlanders! https://www.youtube.com/watch?v=UGepjmfjHyw ..
Rally your forces with 32 additional race/class combinations, including the Ranger, Druid, Warlock, and Bard. https://youtu.be/HoLYBONm10k ..
Every adventure will bring a dragon's horde of magical items to increase your ability to seize victory! 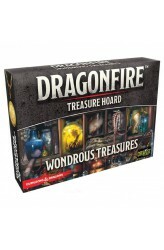 Wondrous Treasures contains 55 foiled cards. .. 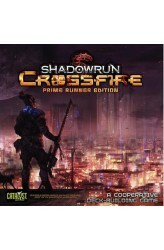 This Prime Runner Edition of the Shadowrun: Crossfire Deckbuilding Game features updated and revised rules, redesigned character cards, and new missions designed to streamline the game and make it more accessible. The shadows of the Sixth World have every kind of danger you can imagine: ultra-violent gangers, flesh-eating ghouls, mages that summon spirits from toxic waste, backstabbing corporate raiders, hard-nosed police officers, and even dragons. You don't have much — mainly your guts, your wits, and your friends — but maybe that's enough. Between you and your teammates, you can sling spells, hack the Matrix, talk a tiger out of his stripes, and bring down a charging ork from a hundred yards away. Will that be enough to face down the worst the mean streets can throw at you? ..
You’re tougher. Meaner. Better equipped. You’ve taken on a drekload of challenges the Sixth World has thrown at you, and you’ve survived. Barely, sometimes, but that’s enough. You’re walking with a certain confidence, maybe even a little strut. You’re ready for the next thing the streets are going to throw at you. At least, you think you are. Now you’re going to find out. 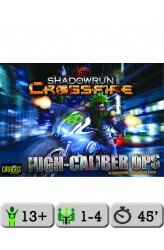 High Caliber Ops is a massive expansion for the award-winning Shadowrun: Crossfire deck-building game. How massive? How does two new character roles, more than a dozen new Black Market cards, fifty new obstacles, and a large bundle of new Karma upgrades sound? On top of that, we’ve got five brand-new missions, and a set of basic cards with new art. Taken together, you have the tools for hi..
Levy. Maneuver. Conquer. 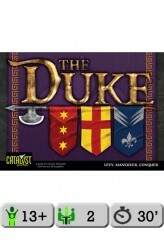 The Duke is a dynamic, tile-based strategy game with an old-world, feudal theme, high-quality wooden playing pieces, and an innovative game mechanism in its double-sided tiles. Each side represents a different posture – often considered to be defensive or offensive – and demonstrates exactly what the piece can do within the turn. At the end of a move (or after the use of a special ability), the tile is flipped to its other side, displaying a new offensive or defensive posture. Each posture conveys different options for maneuver and attack. The full circle is a standard Move, the hollow circle the Jump, the arrow provides for the Slide, the star a special Strike ability and so on. Each turn a player may select any tile to maneuver, attempting to defend hi..